Powerflex Race Front Sway Bar Bushings for R55 R56 R57 R58 R59 MINI Cooper and MINI Cooper S. If your getting strange clunks or noises from the front end these could be the problem. Powerflex has made a high quality polyurethane bushing to be a direct replacement for the OEM front sway bar bushings. Built with the same quality and molds the standard Powerflex bushings are made, but now with this harder black race grade polyurethane. Being harder poly they will have less flex and firm up the movement of the from sway bar even more. These will last longer and be slightly stiffer for improved performance. These come in both the 24mm and 22.5 mm sizes. 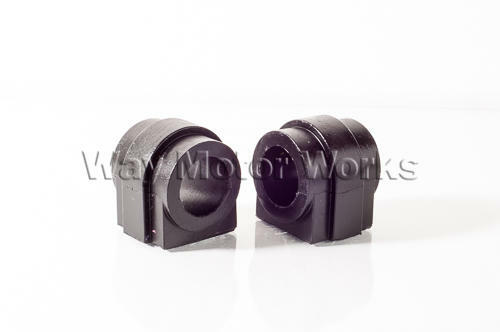 WMW suggests measuring your front sway bar before ordering to make sure you are getting the correct set of bushings. These come as a pair of 2 black race bushings and powerflex grease, enough for one MINI.